Flower arrangements are stunning, heartfelt gifts, and you want to be able to enjoy them for more than just a few days. There are plenty of simple ways to keep that just-plucked look long after you receive a lovely bouquet. Here are a few do’s and dont’s to getting the most out of your blooms. If you’ve ever been to a florist’s shop, you’ve likely noticed that they keep the flower arrangements in a fridge. This is because colder temperatures prevent the flowers from aging too quickly. Place the flowers in the fridge every night before you go to bed and take them out in the morning. They’ll stay vibrant and lush far longer. Once you’ve moved the flowers to a vase, you want them to use the water as efficiently as possible. Remove any dried-out flowers or petals. Water will be wasted trying to revive them, and they may lead to bacterial growths. This can negatively impact the other flowers and create unpleasant smells as the petals decay. Flower arrangements need to go into a vase as soon as possible. The delivery process can be stressful on plants, and the longer you wait to place them in water, the sooner they’ll fade. Use lukewarm water and make sure the vessel is spacious enough that every stem is submerged and has a bit of wiggle room. After a few hours, add some flower food to the vase. Keeping flowers fresh requires regular maintenance. When you change the water daily, trim the stems. Cut diagonally with a sharp knife. Avoid using scissors, as they won’t cut as cleanly. 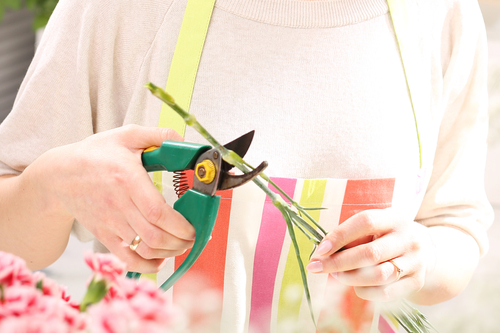 Follow the cut the florist made for the best results. Myers Flowers continues to be the go-to florist service in Branford, CT. This family-owned and -operated business proudly serves the Greater New Haven area. They offer an extensive selection of beautiful fresh flowers arrangements. They have a large selection of floral gifts available on their website, including funeral, anniversary, wedding, and birthday flowers. Call (203) 481-2381 to speak with their staff and connect on Facebook for news and updates.